Getting your website generating leads and being an active part of your sales team is essential to business growth. Your website can cater for unlimited amounts of people and questions and if setup in the right way it can also educate and nurture your ideal customers so they're qualified and ready to buy. However, getting found and getting ideal customers to your website is critical and that's where Search Engine Optimisation (SEO) comes in. Google caters for almost all searches and getting traffic from those searches drives ideal customers to your website. Why? Well, people use Google to search for answers to their questions. If you have content on your website that answers those questions then you're going to attract website visitors and convert them into leads. To make that all happen takes some thought and you can read more about that in our posts on Choosing the right website software for your Automotive company, Choosing the best automotive website design, and 7 of The Biggest Challenges with Web Design in Automotive. For this post, we'll focus on the pros and cons about SEO and attracting website visitors. Lets start with What is SEO? Joe Bloggs is the head engineer at an automotive vehicle manufacturer. They're starting a design project and it needs a fire suppression system. He looks at the results on the first page. 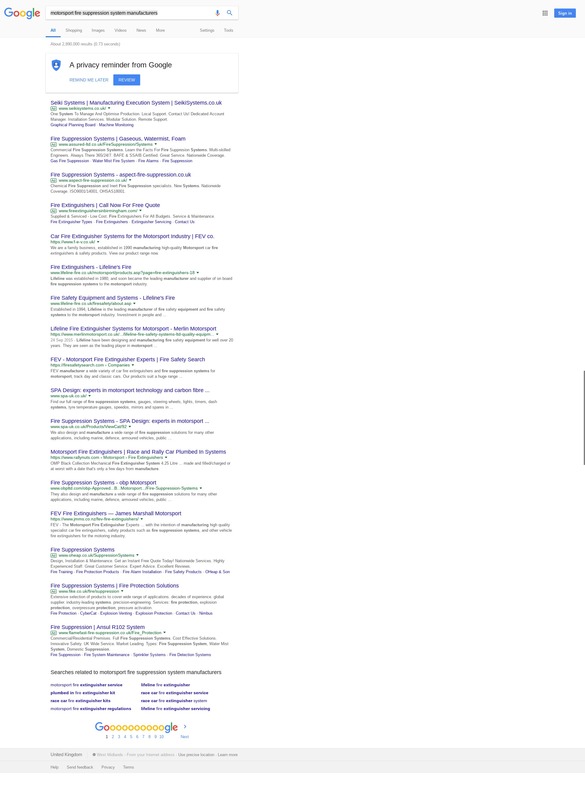 He sees adverts (Ad = paid) and organic results (not paid). He reads the blue text first then the descriptive text. He clicks Lifeline as it seems to offer what he needs. He arrives at the lifeline-fire.co.uk website and continues his research. That is SEO. It's about producing the right content so it's included in search results, making sure the Blue text (Meta Title) and Descriptive text (Meta Description) are optimised to encourage clicks, then having informative and helpful content on your website to answer questions and show that you're the company they need. The next step is optimising your website for lead generation etc but we'll look at that in another post. Now lets look at the Pros and Cons about SEO. If you optimise your website for the right keywords then you're content will be found by the right people, your ideal customers, when they're searching for solutions that your products and services can provide. Understanding your ideal customers, using ideal customer research, is an essential part of know what keywords your ideal customers use, the topics they're interested in, and what they search for. Attracting website visitors from searches are perfect. Why? Because they're active in their buying journey. If you do a cold call then you don't know if the person on the other end actively needs what you're selling, but if somebody arrives at your website it's because they have a need. The more leads you get from search traffic makes your sales team more efficient as they're working leads that have a better chance of becoming customers. If you see SEO as writing great content that answers questions and helps your ideal customers then you're on the right track. Think content topics and ongoing campaigns and you'll be publishing a variety of content that answers many different questions and is useful for your target audience. Do it wrong and you either won't attract any website visitors or you'll attract the wrong ones. If they become leads you'll waste time working them because less of the leads will become customers. If you think of SEO as only keywords (how it used to be) then you'll be missing opportunities. Everybody searches differently, plus, search engines are pretty clever. They understand context and each person. If you search for 'motorsport fire suppression system manufacturers' you will get different results to me. That's because search engines take a look at your history, they know when you've clicked on a result that didn't help (as you jump straight back to the search results) and they know when you've found what you need (as you stay on the website you found and don't go back to the search results). It's more complex than that but ultimately SEO is more than just picking a few keywords and trying to rank number one. If you do SEO without ideal customer research, if you focus only on a few keywords, and if you pack your content so full of those keywords that they're not readable, then it won't work. Consider the amount of words used. Enough to keep readers engaged. When you have multiple pieces of content about a 'topic' make sure to link them to each other to show search engines and humans that you're an authority on those topics. There's plenty more to consider about SEO but this is a good article to get started. If you'd like to learn more about SEO you can take a look at our article on website design for Automotive companies.